Okay, so here’s what happened. 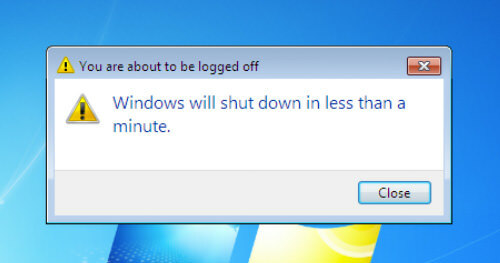 You were on a rush, and halfway across town, you realised that you forgot to shut down your personal computer. Your thinks-he’s-a-comedian flatmate is home and you know things are going to get ugly if he realises that he has access to your still-on personal computer as well as all your social networks and emails etc. What do you do? If you have already setup a remote desktop or vnc on your computer, things may be easier. You can control your PC from anywhere you are. But if you don’t have this set up, the only thing you could do is to make your way back across the day’s traffic to shut it down or face the backlash. If setting up remote desktop is too technical for you, and this thing happens to you so often that there is a need for a contingency plan to be set up, let us show you how you can remotely shut down your computer with a tweet. Yes, a tweet, with TweetMyPC. 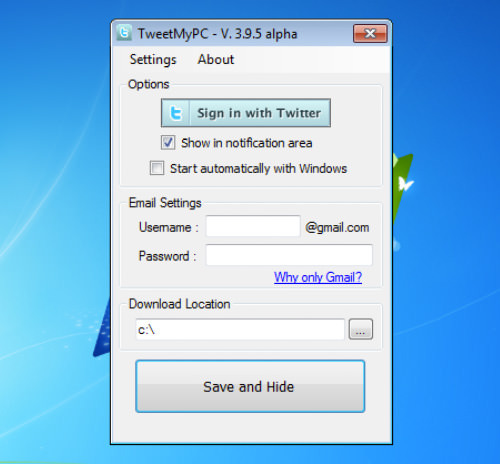 To start sending a tweet command, go to the TweetMyPC download page and download the application for your Windows PC. Open the downloaded file and click Install. 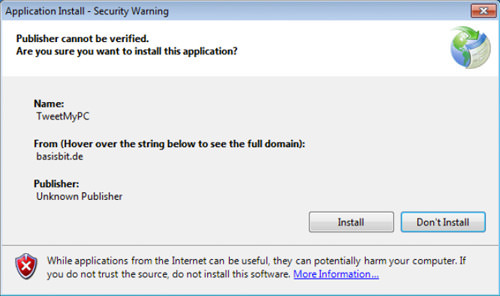 Once installed, launch the application and sign in with your Twitter account. Enter your username and password, and click Authorize App. You will be given a PIN, copy this pin. 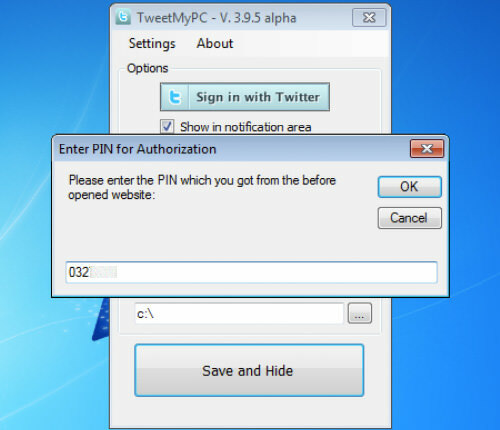 Go back to TweetMyPC application on your PC, paste the pin in the given column and click OK.
Now you are ready to send a command to your PC from your Twitter account. To find available commands, go to About and select Basic Command List. This link will open a webpage on which there is a list of available commands you can tweet to your PC: shutdown, restart, lock, logoff and many more. There is also command to do a screenshot, for when you want to find out what’s going on, on your PC while you are not using it. 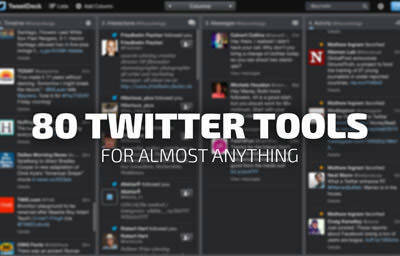 There are many commands available for your reference, you just have to tweet it on your Twitter account. If you want to command Standby, simply tweet ‘standby’, and your PC will follow the instruction. 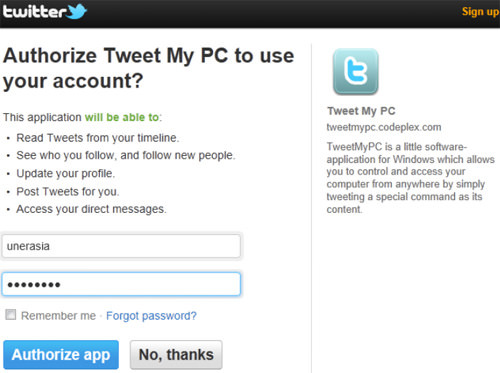 When you tweet a command from your Twitter account, your tweet status will appear and TweetMyPC will recognize it and send an instruction to your computer. After the instruction is sent to your computer, it will then auto-post a tweet status to your Twitter account. 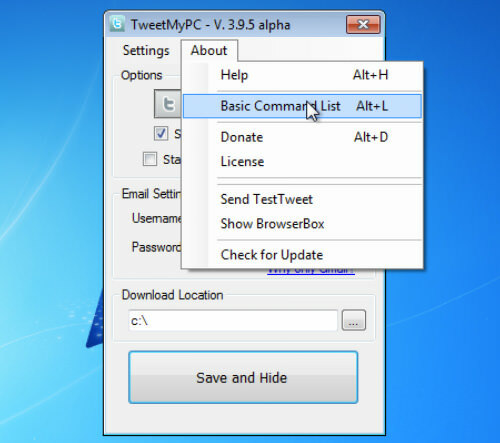 On your computer, once the command is received, TweetMyPC will acknowledge the instruction with a notification popup. Since TweetMyPC is using Twitter as your command channel, you may want to create a special account only for this purpose, and to set every tweet on privacy mode. This is to avoid tweet spam and any potential tracking of your personal computer. You can change tweet privacy from your Twitter settings page.